Everything's been a little crazy around here and I've been on the computer WAY less than usual, but quick report because I know some of y'all probably thought I died or something. I didn't! HI! (This is the hotel which was the same price as a freaking La Quinta.) But that's just "stuff," the meat of the visit went GREAT. Ye'let is definitely "set" on her first (only, honestly) choice of school, and it should be attainable. (She plans to major in maritime administration and logistics, and her school has a five year master's program. She should enter with 36 fully transferable credit hours from her high-school dual-credit work - see, we're not total jackknobs here in Texas - so she could ostensibly obtain said master's by the time she's 22. Basically, it's an MBA with a focus on the maritime industry.) So, she's psyched. But yikes. it's so, so far away. I mean, not "states away" but 9 hour-drive-away. After everything that happened this year with eldest Daughter I'm a little freaked out. But I know it's coming, there's nothing I can do about it, and welcome to parenting. It's terrifying. So yeah, I'll be down there once a month, buying all the liquor and hanging out on the beach trying to pretend I'm not hovering. ("I'm not hovering, Ye'let, I just love the beach. See, I'm not even leaving the hotel! Want to come stay with me?") OK, no I won't. 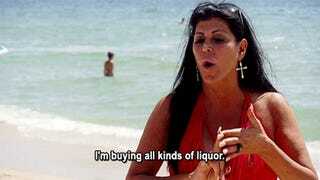 But I might need all kinds of liquor. Anyway, just wanted to check in. It's homecoming week, which is kind of insane and weird here in Texas (no, Labeled, you don't say) so I may still be scarce, but I lurve y'all.